What’s Holi without the colours? It’s a custom in India to welcome the spring season by playing with colours on Holi. Around the time of the festival, colour powders in various hues are sold in all the bazaars across the country. Without Holi colours, celebrations will be incomplete. Back in the days, Holi was played with natural colours, sourced from plants, flowers and kitchen ingredients. But these days, people have switched to artificial colours for convenience. These colours can be easy to use but come with many side-effects, especially if they stay on the skin for too long or enter the eyes and nose. If you want to celebrate a safe Holi 2019, here are 5 DIY colours you can make at home from scratch. 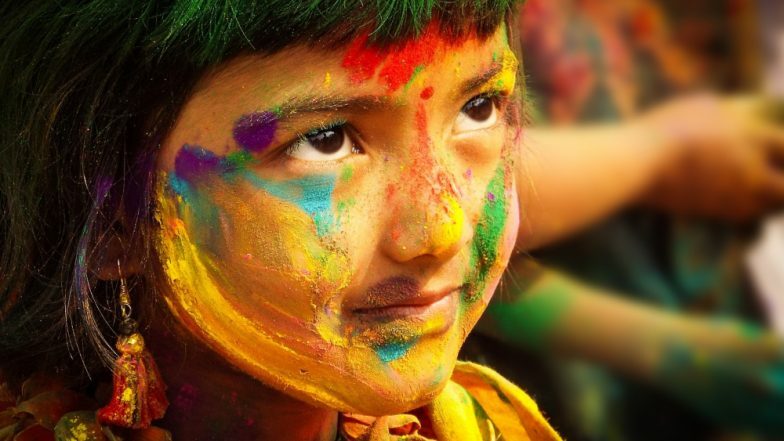 How to Protect Your Skin from Gulal and Harmful Holi Colours. No prizes for guessing, but turmeric is the best household ingredient for yellow colour. It’s available in a ready-to-use powder form that can be used right out of the packet. Trust a good brand. It’s better if it’s organic. But turmeric is notoriously difficult to remove. So mix it with chickpea flour, Multani mitti or rice flour. Plus, turmeric does the skin a lot of good. It has antiseptic properties, which help treat many skin infections. Happy Holi 2019: 5 Must-Visit Places in India to Celebrate the Festival of Colours. For red coloured powder, use Raktachandana or red sandalwood. Known by its botanical name Pterocarpus santalinus, red sandalwood is a tree known for its red-coloured wood. It is an important ingredient in Ayurvedic lepas meant for skin diseases. Red sandalwood powder is used for treating many skin diseases due to its antiseptic and anti-inflammatory properties. The powder is available at stores that supply Ayurvedic drugs. To make a beautiful, rich orange hue, mix red sandalwood powder with turmeric. This can be used in both wet and dry form. If you want a brighter orange, use more turmeric and if you want a deeper shade, increase the ratio of red sandalwood. For magenta coloured powder, you can either use dehydrated beetroot powder or beetroot juice. To dehydrate beetroot, you can leave thinly sliced beets in the sun for a few days or place them in the dehydrator. Or if you don’t want all the hassles, simply juice a few beets and mix the liquid with rice flour. Children can use this slurry as a wet colour. If you can’t get your little ones to eat them, grind them up and use them as Holi colours. Leafy greens like palak can be juiced or ground into a fine paste for a bright green hue. You can also mix it with a little bit of besan or chickpea flour to make it easier to apply. For the dry powder, you can buy packets of neem powder and mix it with rice flour for easy application. Multani mitti or fullers earth is used as a base for many skin preparations. It has a clay-like consistency, which can be mixed with other ingredients. For a rich brown colour, mix instant coffee powder with some Multani mitti. None of these natural colours is harmful to the skin. The best part is that the shades don't stay on the skin for an uncomfortably long time. If making these colours are too tedious, you can always opt for food colours. Available in all the shades of the rainbow, food colours can be easily mixed with cornstarch, Multani mitti or rice flour.